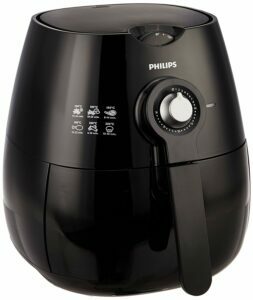 Philips HD9220 is the best air fryer in India. It is compact, easy-to-use and does a good job of frying, grilling, baking and roasting a variety of foods. Its affordable price and flexible utility, makes it a perfect appliance for your modern kitchen especially if you’re a bachelor, a busy couple or a space conscious consumer. 2.1 Do you really need an Air Fryer? 2.2 Who should buy an Air Fryer? 2.3 How does an Air Fryer work? Let’s say you get home a pack of McCain potato wedges. Deep-frying and even shallow frying is out of option as it involves dunking the wedges in a lot of oil. If your New Year’s resolution includes shifting to a healthier diet then you need to reduce your oil intake to minimum or zero. This Air fryer from Philips helps you do just that! Philips was the first company to launch Air fryers commercially owing to their patented Rapid Air Technology. This patent ensures that no one can mimic the output quality of Philips Air fryers in terms of taste, utility and efficiency. Coming back to the potato wedges; eating healthy need not mean cutting out foods you love. With Philips Air fryer you can make your favourite foods with less to no oil in less than half an hour! The food basket can hold up to 0.8 kg of food. Just pull out the food basket, add the quantity you want (or that fits), sprinkle a few drops of oil and put the basket back inside the Air fryer. This Philips Air fryer comes with mechanical knobs for selecting the temperature (up to 200 degrees Celsius) and time (1 to 30 minutes). The light remains on to indicate the food is cooking. You can pull out the basket, occasionally (no need to turn the Air fryer off) and shake the wedges to ensure even frying. While the food cooks, you can catch up on a phone call or watch your favourite TV show. Once the food is ready, the Air fryer sounds analarm and automatically shuts off. You are then free to enjoy your favourite food, guilt-free. You also get a free food separator, so you can cook different food items in the same basket, at the same time. The Air fryer is not limited to frying fast foods. It can also grill, roast and bake. You can try the recipes from the free recipe book to get started. The Air fryer also has air filter to prevent any pungent odour from escaping the fryer. The parts are dishwasher safe, making cleaning more convenient. Overall, this one is the best Air fryer in India in terms of brand value, features, performance and quality. If you prefer clarity and style, then this Air fryer is for you. Kent Air fryer comes with an LED display and touch panel. You can thus confirm the settings leaving no room for errors. The touch panel also adds an air of elegance to an already sleek Air fryer. Slightly larger than its other counterparts, this one can hold up to 1.4 kg of food in its food basket, making it ideal for a family of 3-4 people. With cooking options like grill, steam, bake, roast and fry the list of dishes you can cook with this is long! The handle is cool-to-touch (even in use) and is connected to the perforated basket which holds the food items. Once you insert the food, you can set the time and temperature. Or you can select an option from the Quick menu like peanuts, fish, chicken, defrost, French fries, samosa etc. The Air fryer automatically shuts off when the food is done and you can immediately take out the food. The ‘cool down’ option begins the process of cooling down the Air fryer, as it gets extremely hot while cooking. The Air fryer is also easy to clean and comes with a warranty of 1 year. If you don’t own a convection oven, then this Air fryer is an economical option as a quick and healthy cooking appliance for your modern kitchen. 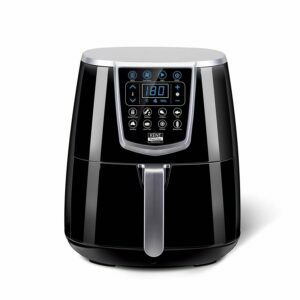 With the trending digital age, even Air fryers have gone digital. This particular Air fryer from Havells is popular among users for its touch-screen menu and attractive design along with a consistently good cooking performance. With a capacity of about 1.4 kg, the food basket can hold a variety of food items like chicken drumsticks, veg cutlets and more. However, it cannot cook pop corn or cup corn or any food item that jumps around in the food basket. The touch panel facilitates easy set-up of time and temperature and sounds off alarm when the food is ready. The exhaust behind the Air fryer filters and discards the hot air without leaving any lingering odour. The Air fryer does not require much maintenance. Its parts can be wiped clean or with the help of a dishwasher, adding to its convenience. Consuming 1230 Watts of power, this Air fryer can grill, fry, roast and even bake foods you love, to perfection! The compact build and easy functionality of this Air fryer makes it suitable for bachelors or people living away from home. The Air fryer is quite portable and can fit even in a 10th graders school bag. If you’re a working professional or a lazy cook, you can use the Air fryer to make quick snacks. 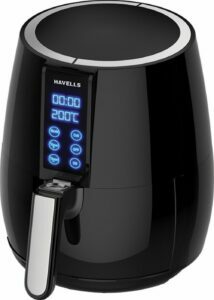 This Havells Air fryer offers modern cooking options in a value-packed deal! 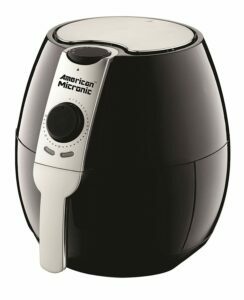 Would your life be any different with an American Micronic Air fryer at home? Well, let’s do a walkthrough. It’s the weekend and you’re having some friends over for lunch. You’re on a multi-tasking mode with parathas cooking on the gas and pulao getting ready in the cooker. You need to get working on the starters, its kebab, and you have the patties ready to be fried. Quickly wiping the paratha flour off your hand, you pull out the Air fryer’s food basket. You then place a few kebabs inside and rub a little oil on each (so that they don’t stick). You insert the basket back into the fryer and turn it on. You then adjust the knobs to set the time in minutes and the temperature (up to 2000C). You get back to your parathas and other preparations while the Air fryer cooks. You can use the Air fryer to roast, grill, bake and fry a variety of dishes. Once the kebabs are done, the Air fryer dings and automatically shuts off. Your kebabs are ready to be served! The mechanical knobs and the fryer’s body can be easily wiped clean. Unlike touch panels, that tend to get damaged with rough use, mechanical knobs are more durable. In case the product breaks down unexpectedly, the warranty has it covered for 2 years, longer than other Air fryer brands in the market. All-in-all if you’re looking for a non-stick, functional Air fryer with a good warranty coverage then this is a perfect buy. Prestige is a popular brand in India for utensils and kitchen appliances. Prestige once again brings its expertise in the dry heat cooking segment by introducing its Air fryer line-up. With 2 litres of capacity, the food basket lets you cook a variety of dishes by grilling, roasting, baking or frying them. You also get a recipe book to help you get started. The perforated basket can be made more functional by adding a separator so you can cook 2 different items at the same time. However, a separator is not included in the product. You can use an existing grill instead or buy a food separator. The control knobs make setting up time and temperature, easy to use and clean. The Air fryer also has air vents located at the back, which filters out the heat built up while cooking without letting any odour fill your kitchen. The Air fryer’s compact build makes it handy to shift around the house or if you frequently change homes. It is also a good substitute for a number of kitchen appliances like convection oven, toaster, toaster oven, deep fryer and electric grill. Hence if you buy this Air fryer you don’t need to buy any of the above appliances unless your family’s requirements go up. Air fryers are perfectly suitable for families of 1-4 members. If your family is larger, you better go for an oven instead. Overall, this is one of the most budget-friendly Air fryers in the market and it definitely won’t let you down! There are newer and newer product launches every year. And no matter how attractive their marketing strategies may make them look, many simply hog up space or aren’t as useful as they claim to be. Many times, after visiting the mall, you might’ve found yourself home with stuff you never needed in the first place, only because it looked good or was on offer or because the salesperson knew ‘just the right product for you.’ I have been there too. When one such product broke down on my first use I decided not to give in to whims and trends anymore and only go ahead with a buy when there’s sufficient evidence of the product’s usefulness. I’ve applied this strategy to all my product reviews including Air fryers. This is why, I strongly recommend against buying an air fryer IF you already own a convention oven. Because both do the same things i.e. fry, bake, grill and roast food. Only, the oven cooks more food at a time and hence takes a little longer to finish cooking or roasting or whatever it is that you’ve set it to do. That doesn’t mean that Air fryers are useless though. It’s just that you would only be getting another convection oven home, only a bit smaller and rounder this time. But what if you don’t own a convection oven and have no plans to buy one soon?Well, then you might be a right candidate to buy an Air fryer. However, to confirm whether you really need an Air fryer, check if my list below feels like you. Who should buy an Air Fryer? Many times, we fall prey to peer pressure (my neighbour has one) or marketing gimmicks (Ads endorsed by favourite actors) and end up with products that do nothing more than remind us of how foolish we were. But not this time. Check out my list below of who should buy an Air fryer and see if you can relate to any of them (psstt… if you don’t relate then it’s safe to conclude you don’t need an Air fryer and you’re better off investing that money elsewhere, that’s just a suggestion though). If you’re a bachelor or bachelorette living away from home or with room-mates, an Air fryer can be a good companion. You can quickly cook up recipes from French fries to grilled chicken in minutes with a few settings. Once you set the time and temperature the Air fryer doesn’t need any supervision (except shaking the food basket occasionally). You are free to finish the piled-up laundry or any pending work in that time. Also, if you frequently change houses, Air fryer is travel-friendly i.e. it is easily portable. Someone wise has said, ‘Money doesn’t grow on trees’ and rightly so! In the growing world of consumerism, everyone already has a long bucket-list waiting to be checked off. There’s only one shortage— money; there’s just never enough money to buy everything we want. If a healthy body is on your bucket list then an Air fryer is a good appliance to help you do that without burning a hole in your pocket. You can shift to a healthier low fat, less oil lifestyle at a minimal cost! Most Air fryers cost below 10000 Rs with the uber premium ones falling in the 20000-45000 price range. I would never recommend you buying the premium ones as you might as well buy a nice oven instead in that price. You can also opt for a no cost EMI option to widen your budget. EMI plans take the pinch out of paying a large sum upfront, freeing up your budget to check off another item on your wish-list. Space is costlier than gold in crowded cities like Mumbai. And sometimes we ourselves crowd the house with too much stuff. Buying a new appliance in such cases, almost always means throwing out another one or rationing the size of the newer appliance. Air fryers are perfect for such space-conscious homes. They do almost everything a convection oven does and fit anywhere on the kitchen counter. You can also place them in the living room or bedroom as they don’t give out any odours or leave greasy stains. In fact, an Air fryer can replace six other kitchen appliances like toaster oven, toaster, deep fryer, traditional oven and electric grill along with the convection oven. Imagine how much space you can save with one Air fryer! When there so many ready-to-eat options available like restaurants, and maa-ke-haath-ka-khana, cooking with your own two hands is just too much work. If you think the same then welcome to the ‘I-don’t-cook’ club! But what do you do when your mom/wife takes a holiday or you’re bored of eating restaurant food? Air fryer simplifies cooking for such I-don’t-cook users. You can easily “cook” frozen food recipes or reheat pizza slices when the kitchen is temporarily in your hands. Air fryers also ease the process of shifting to a healthier lifestyle by letting you cook restaurant-like food albeit with much, much less oil (Manufacturers claim Air fryer can reduce your oil intake by 70-80%). Air fryer offers one of the safest and healthiest ways of cooking your favourite food! We all are guilty of indulging in the pleasures of life called ‘fast food’ (often more than we like to admit). It is only when we stand on the weighing scale and in front of the doctor with abnormal blood reports in hand, do we realise the toll fast food has taken on our health. Drastically changing unhealthy eating habits is not just difficult but also unadvisable. Instead it is better to first shift to a healthier cooking method like cutting out oil, fatty foods and excess starch from your diet along with regular exercise. Air fryer, provides this less to no oil option for cooking your favourite fast foods like pizza, french fries, burger patties and so on. So instead of suddenly switching to salad-only diet (trust me, it doesn’t work) switch to a home-made, healthy fast food cooking instead with an Air fryer. The other thing we’re always short of, other than money, is time. Working or even shopping for daily necessities can be tiring. Going home and spending another two hours cooking in the kitchen is no one’s idea of relaxation. Air fryers, help you save time and efforts, taking the load off you. With an Air fryer you can cook up quick snacks and yummy delicacies within half an hour! So, if you’re a busy bee too then an Air fryer will be of much help to you. An air fryer is a compact and elegant addition to the modern Indian kitchen, which is based on a simple working mechanism (popularly called Rapid Air Technology). The Air fryer heats up the air and circulates it through the food inside its chamber at a high speed, continuously. It consists of an air fryer base, food basket and a basket base. The air fryer base holds a heating element that can raise the temperature of the air up to 200 degrees Celsius. This heating element or coil is located right above the food basket for maximum exposure to heat radiation. The hot air is then directed and redirected from the bottom of the food basket into the food inside it. The food basket itself is an enclosed container with a perforated bottom that is used to hold the food items while they are cooking. It is usually made of steel or non-stick material for ease of cleaning. The food basket is held securely, in another basket base below it, which collects any food or oil that slips out of the food basket. This prevents any damage to the air fryer and also facilitates easy cleaning. But how does the air fryer maintain the set temperature? Most Air fryers allow you to set the cooking temperature, so when the air inside gets too hot the pressure rises too. This is why air fryers come with their own exhaust system which filters the hot air and releases it outside. This keeps your kitchen from smelling like some fast food joint and also ensures optimum cooking temperature within the air fryer. And don’t worry about accidently burning yourself, most air fryers are cool-to-touch which makes handling them safer and convenient. Check out this article to know more. What to cook and what not to cook in an Air Fryer? As explained in how does an Air fryer work, Air fryers use ‘hot air’ to cook food which is basically dry heat. When dry heat is used to cook food there are three distinct outcomes— ‘browning’, ‘flavor’ and ‘aroma’. According to thespruceeats,‘Dry-heat cooking refers to any cooking technique where the heat is transferred to the food item without using any moisture. Dry-heat cooking typically involves high temperatures, meaning 300°F or hotter’. This reaction is scientifically termed as Maillard Reaction. It involves complex and simultaneous chemical reactions between amino acids (proteins) and reducing sugars, in a variety of foods from coffee beans to bread and meat to alcohol. Let’s consider the crispy bread that goes perfectly with a cup of chaai, in a sandwich or with a slice of cheese (take your pick!). In this case, a plain loaf of bread is converted into golden brown, slightly crunchy bread, having a distinctive aroma, by a simple act of cooking on a pan with little butter. This too is a Maillard reaction with its three main characteristics of texture, flavor and aroma. The results of Maillard reaction thus variy from food to food. Another example is the roasting of coffee beans at different temperatures which bring out different characteristics like acidic, tangy or sweet. The air fryer too utilizes the dry heat to induce Maillard reaction and you get a crispy brown and aromatic dish within minutes! The use of air fryer extends to any recipes, which make use of this dry heat cooking technique (or Maillard reaction) namely frying, roasting, baking and grilling. This widens your cooking options, to more than just samosas, pakoras, tandoors, or pizzas. Preferably, optfor an air fryer which comes with a recipe book to help you get started. Although grilling and broiling give better results on an open flame, you can obtain close to similar results with an air fryer. And if you’re not really a fan of cooking, you can use the air fryer for reheating pizzas and cooking frozen ready-to-eat foods like nuggets & tikkas. And for the time-conscious couples or busy bachelors, a batch of pakoras or potato wedges can be prepared in minutes! In fact, you can get started right now with a few simple recipes from simplyvegetarian777. Air fryers are closer to convection ovens in terms of their working principle. Convection microwave ovens, however, can do all the things an air fryer does and more. Counter-top convection ovens are trending in India and are one of the most preferred modern kitchen appliances desired by consumers. So where does an air fryer stand in this competition and should you get one home? Both appliances show similar results in the quality of their roasting, baking, grilling and frying outcomes. This is because both convection ovens and air fryers use hot air i.e. dry heat cooking technique to cook food. The time-to-cook is however, shorter in air fryers than convection ovens as the heating element is situated directly above the food basket. But convection ovens also use microwaves to cook food which significantly increases the number and variety of dishes you can cook in them. Air fryers are compact in size and design. And they’re notably smaller than most microwave convection ovens. Overall, ovens hog up more space than air fryers, making air fryers a better option if you’re short on space. Because of their small size, the capacity of air fryers too is lesser compared to ovens. Convection ovens begin from a capacity of about 17L while most air fryers are in the range of 1-2.5 Litres. 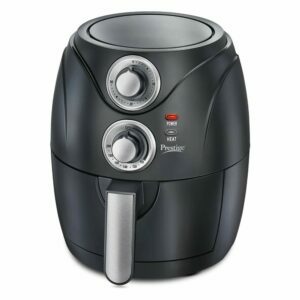 Their small size and capacity make air fryers a good option if you’re a bachelor, or if you’re living away from home. If your family size is larger, it’s better to go for an oven instead. Usage includes two aspects— ease of use and cleaning & maintenance. In both these aspects air fryer is a clear winner. That’s because you have to select between just two parameters (time and temperature) in an Air fryer. This makes usage simpler. While a convection oven comes with a lot of settings and auto-cook menus, which may need frequent referring of user manuals. Many air fryer baskets are even dishwasher safe or easier to clean in general. Convection ovens, on the other hand may demand more of your efforts to get clean. This is quite an obvious point, really. Convection ovens are costlier than air fryers owing to their larger size, complex functions and sturdy build. Air fryer’s parts are mostly made of plastic and other less durable materials which is why they’re cheaper and don’t promise to last as long as convection ovens. However, their low price is worth buying an air fryer as it’s a low investment, low risk product with considerable benefits. If you already own a convection oven, don’t buy an air fryer. Both do the same thing. Getting an air fryer will just take up more space and money while bringing no unique benefits to the table. If you don’t own any oven, then buying an air fryer is a wiser option as it will save you money, space and efforts. This point is applicable only if you have a small family of 2-4 members or if you’re on a tight budget. Go for an oven instead if you have a large family size. Check out my article on the Best microwave ovens in India to find the best ovens in India. Air fryers offer one of the safest and healthiest way to fry foods you love! And without the guilt of calories and cholesterol. Air fryers can fry, roast, grill and bake stuff with only 1-2 spoons of oil or no oil at all! This is because they induce the Maillard reaction (required for the ‘fried’ taste and look) with the help of just hot air. Air fryers are thus similar to convection ovens in the way that, they help lower your oil usage.Many manufacturers claim that air fryers can lower your oil intake up to 70-80%. Indian food is already heavy on oil and adding new fast foods & frozen foods further increase the oil consumption in our daily diets. Air fryers can thus be a life-saver by helping us cook our favourite foods in a healthy way, right in the comfort of our homes!